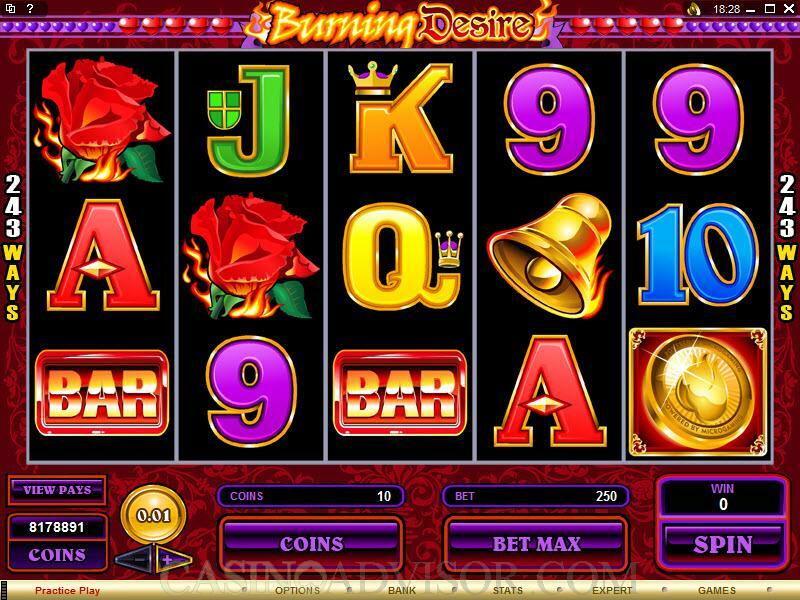 Burning Desire is a brand new and very intriguing video slot game designed by Microgaming, perhaps the most recognizable name in the online casino software business. This is a five-reel game where the maximum wager is 250 coins. In this game there are 243 permanently-enabled ways for you to win. Burning Desire features a wild and a scatter, as well as two great bonus games. The flaming Diamond symbol rules here - get five in a row and you're going to hit a jackpot of 3000 coins. The Burning Desire video slot game has a scatter, the Coin symbol, which is self-explanatory. As a scatter, this symbol can be anywhere on the five reels to complete winning combinations, contingent upon two or more of them appearing. The game also has a wild symbol, which is naturally called the Burning Desire symbol. Wilds can substitute to complete winning combinations (obviously they don't apply to scatter combinations). The bonus games are pretty straight-forward. One of them is the Free Spins Bonus Game, which is triggered by the appearance of three or more Coin symbols (scatters) anywhere on the five reels. 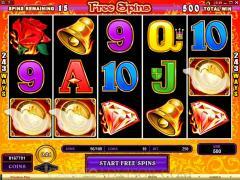 In the Free Spins Bonus Game, you will get fifteen free spins, and all wins are tripled. Then you can win an additional 15 spins if three or more Coin symbols appear once again. You can win up to 90,000 coins in this bonus game. The other bonus game is the Gamble Bonus Game, which is activated upon any winning situation. What you get to do is very simple - guess the color of a face-down card, whether it is Black or Red. If you guess correctly, your win is doubled. Then you can gamble again, up to five times, or whenever the gamble limit is reached. The minimum coin size in Burning Desire is 0.01, with the maximum set at 1.00. The most coins you can bet in the game is 250, and you can affect this by clicking the "Bet Max" button at the bottom of the interface (you can't miss it). Interested in reading more detailed information about Burning Desire? If so Click Here for more details.